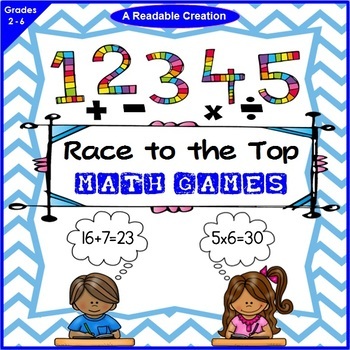 These mental math games provide a fun way for your students to revise / reinforce operations - addition, subtraction, multiplication, and division. 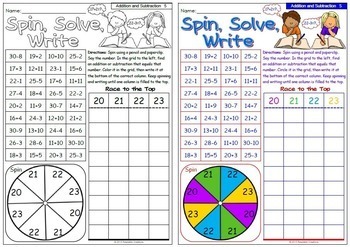 Each game can be played in pairs or a small group; each student has their own game sheet. The winner is the first person to reach the top of any column. The games can even be played individually: the aim is to race to the top to see which column wins. *In every grid, each row presents a math fact for each of the numbers in the race. ~Variation: Using the 'Addition and Subtraction' pages and 'Division' pages - In pairs, each with their own sheet, each student picks two numbers to find and write all the math facts for those numbers that are written on the sheet. They write these facts in the correct columns from the bottom to the top. The first to fill both columns to the top is the winner. *Remember that there is a math fact for each of the four numbers in each row. 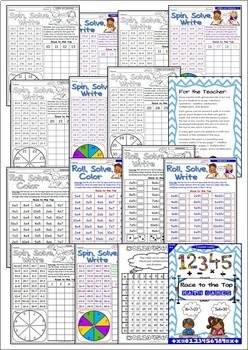 Included in this pack is a blackline and colored version of every page: 7 ‘Addition and Subtraction Spin, Solve, Write’ pages, 8 ‘Addition and Subtraction Roll, Solve, Color’ pages, 5 ‘Multiplication’ pages, 2 ‘Division Spin, Solve, Write’ pages, 2 ‘Division Roll, Solve, Color’ pages, and a multiplication table up to 10x10, and 4 'Roll, Think, Write' sheets. This is the U.S. version - there is also a British English version listed.